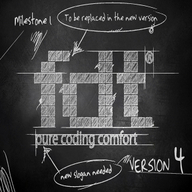 The FDT team is proud to show you the release of FDT4 Milestone3 live. This milestone release is dedicated to Flex 4 and includes support for the new MXML 2009 language features like Spark, FXG, States and the new language tags. In milestone 2 we've introduced the new SDK and project management which features project types, project templates and a simplified SDK management. In M3 we could leverage this new system and simply add the new project types and templates for Flex 4. We are also shipping the Flex 4 SDK and adding it to your installed SDKs automatically. Flex 4 introduced a nice new way to define and use states in your MXML view classes. FDT 4 M3 fully supports this new concept and offers autocompletion, occurrence marking as well as rename refactoring for states. Make use of the new FXG declarative graphics format either by using external .fxg files or directly inside your MXML classes. Use the new MXML 2009 language tags like "Declarations", "Definition", "Library" and "Reparent".